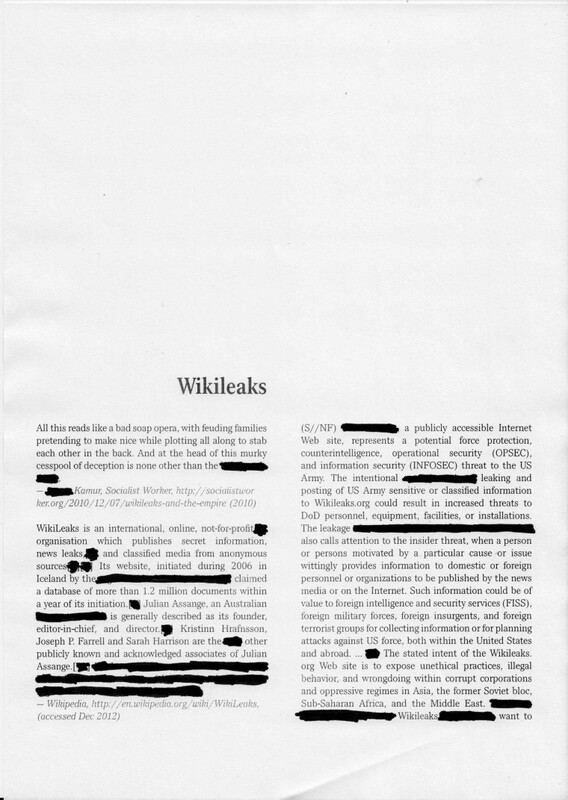 If Wikileaks helped revitalise narratives by revealing behind-the-scenes dialogues of power, has it – as a phenomena and an organisation, now (or over the course of the last two years) slipped back into the known, dominant narrative structure as the drama of its principle and figurehead eclipses the stories WL exists to distribute? We’ve found we’re swimming in similar territory to Jerome Bel and his work Véronique Doisneau wherein the Paris Opera’s Doisneau dances excerpts from many of the corps de ballet roles of her long career as part of the dancing working class. Needless to say, she stands still and is a wallflower for long periods of time. Work progresses on the narratives of the corps de humanity and eclipsing the principles. It’s an old challenge but a good one, and a good time for it.